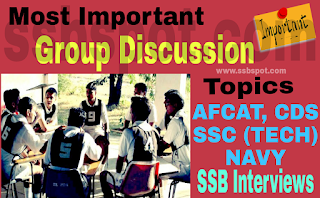 If you are going to attend your SSB interview then you must know what is going on around you.Group discussion is the part of GTO series which is the very first task of GTO. Doing well in this task can have a good first impression on the mind of GTO as well as it can provide you a Lead role in our group.There are two discussions in first discussion candidates get choice and in second discussion candidates don’t get any choice.In the first part of the discussion GTO will provide two topics & candidates are supposed to choose one out of two. In the next part of the discussion topic will be of GTO’s choice. Each discussion will last for 15-20 minutes. *Remember this discussion is an exchange of ideas not a one way traffic. Corruption in India : What do you think who us responsible for this? What is the biggest reason behind the low literacy rate in India? Criminalization in politics is increasing day by day, how can this problem be solved? Should ''Right to Privacy'' have limits ? Is "Make in India " a success ? Swachh Bharat Abhiyan : How far is it successful ? Impact of GST on Indian Economy. Who is responsible for the deteriorating law & order in the country? Indian Economic Slowdown - Is it a long term problem? Should there be reservation system in Institution ? E-commerce: Discounts are harmful in long run? Rohingya Refugees – Security Threat to India or not? 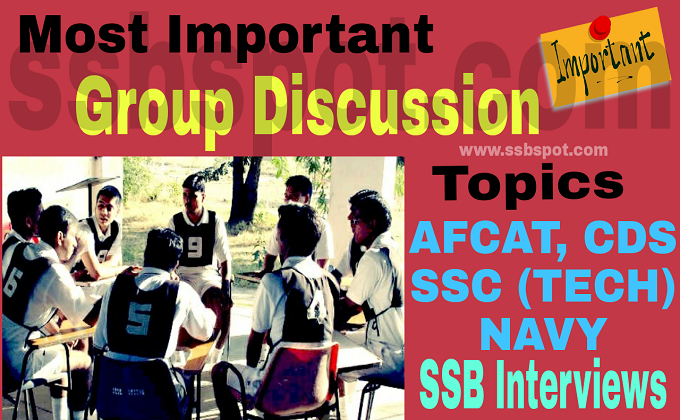 Also Read : what is Group Discussion ? How to perform in it ?